Mega Sale! Free Shipping Included! 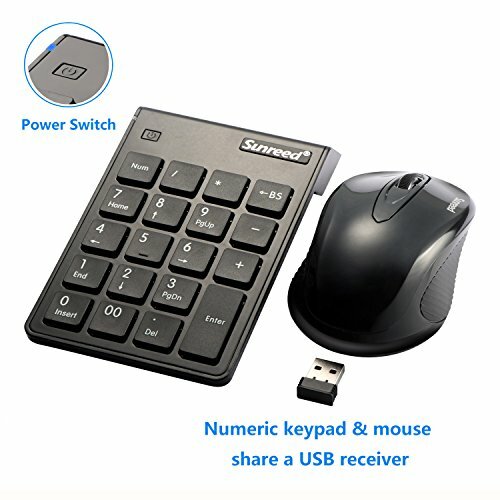 Save 23% on the USB Numeric Keypad & Mouse Combo, Sunreed 2.4G Wireless Mini USB Number Pad Keyboard and Mouse for Laptop Desktop Notebook, with Power Switch, Just One USB Port - Black by Sunreed at Pacs BG. MPN: 151-00104. Hurry! Limited time offer. Offer valid only while supplies last. Perfect For Extending Your Keyboard, Easy Your Life!Sunreed 19 Keys Wireless Numeric Keypad is the perfect accessory to complete your workspace. Perfect For Extending Your Keyboard, Easy Your Life! Sunreed 19 Keys Wireless Numeric Keypad is the perfect accessory to complete your workspace. Featuring a full keypad with Number Lock, the Wireless USB Number Pad is a great wireless solution for extending your existing keyboard! 1. Simply plug the USB receiver into an available USB port of your computer and it's ready to use, no driver needed. 2. Ergonomic design, thin and compact Mini number pad can be put in a laptop bag or briefcase for efficiently entering data wherever you go. 1. Optical tracking engine, no moving parts. 2. 1200 DPI optical precision switchable. 3. 3 level power saving mode. 4. Auto power save model. 1. When the red light blinks, it indicates the battery is low, please kindly replace the battery.